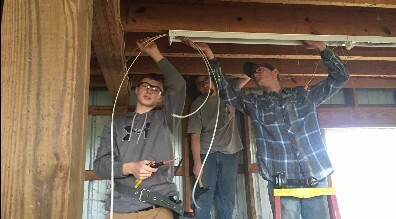 The Electricity program is designed to provide students with the necessary skills, concepts, and attitudes for entry into the fields of electrical installations, maintenance, manufacturing, service, and repair. Basic electricity, the national electrical code, electric motors and their controls are covered, as well as an introduction to planning, layout and installation of residential and commercial components associated with the electrician's trade. Students are taught the Contren curriculum, a 5-step apprenticeship program. The core program and levels 1 and 2 are taught at Triplett Tech. Students who wish to continue with levels 3 and 4 may complete them in Chantilly, VA, or at Triplett Tech in the evening. If students complete the core program and levels 1-4, they will fulfill the state requirements for an apprenticeship program and qualify to take the journeyman test (with 2 years on-the-job training).